DCY-2057 Dual Pressure Controller - Hotek Technologies. 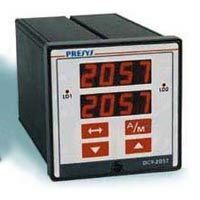 DCY-2057 DCY-2057 Dual Pressure Controller. tests and specified according to the strictest worldwide norms. One or two pressure inputs; gage or absolute pressure, including vacuum. also standard is the 24Vdc power supply for two-wire transmitter. 4-20mA (750 ohms maximum load), 1-5Vdc or 0-10Vdc analog output. rated for 3A at 220Vac. Logic signal, open collector transistor, 40mA/24Vdc maximum with isolation. SPST and SPDT relays rated for 3A at 220Vac.